Saturday Nov 23rd dawned very cold, but we had to turn out at 7 am to play Reveille. 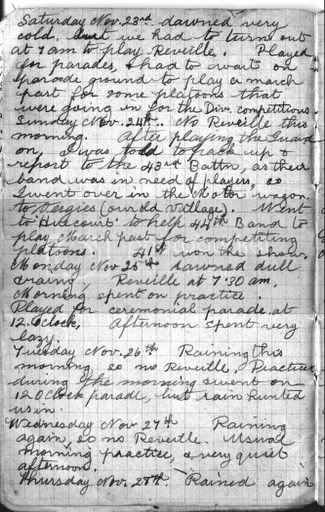 Played for parades, & had to wait on parade ground to play a march past for some platoons that were going in for the Div competitions. Thursday Nov 23rd started out very warm, and will be getting hotter by the looks of it. Should be a good day for the start of the First Ashes Test, anyway.